We’re holding our annual Christmas giveaway RP event, when some rude little Hordeling strolls through! I showed her the way out with the help of some others. And my heroes, the Stormwind Guards! This makes it our first RP-PvP Christmas Giveaway! For those that care, every year around Christmas our guild does certain things. The Christmas Giveaway is where we give out some useful items to players in the trade district of Stormwind. Mostly it’s for lowbies, but occasionally the items are useful for other players. THE HORDE HAVE A NEW SECRET WEAPON! Next story A walk in the forest, with Altered and Afflikted! 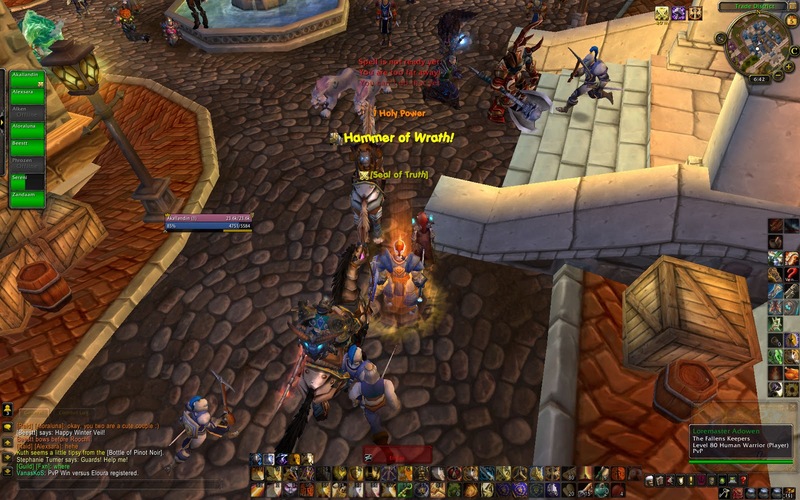 Previous story Vlad’s final pre-Cataclysm world PvP event is tonight!